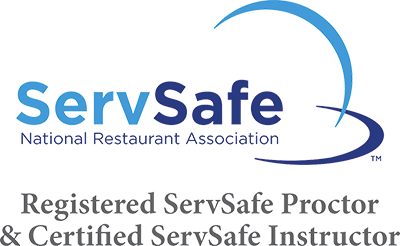 ServSafe® Food Protection classes run approximately 6 hours including the exam. We do a working lunch and keep our breaks short. Class includes the written exam (10 days for results). Online exam available at the class for additional charge for immediate certification. Laptops available at class on a first come first serve basis. All training materials incorporate the latest information from the most recent FDA Food Code. We use only the ServSafe® Manager 7th Edition for all class instruction. There are different hours of training required not only in different states, but cities as well. We will insure that you meet your states requirements with our online training options in conjunction with a live class upon request. Our class is designed for those that are certifying for the first time or renewing your certification and will meet all regulatory requirements. The exam is 90 questions multiple choice and you need a 75% or better to pass. It is a two-hour timed exam and you cannot use any notes, books or study materials. Exam accommodations can be made for language as well as disabilities. These accommodations must be made in advance prior to class. A paper dictionary translating English to your primary language is allowed if notified prior to the exam. No electronic devices are allowed to be used at any time during the exam. Class Material Options - These are for attending one of the scheduled class locations below. Group rates available as low as $85 per person! Price includes use of the ServSafe® Manager Book, Study Portal Access, Live Class and the Written Exam. Email for more details! SPANISH CLASS AVAILABLE ONLINE AT NO ADDITIONAL CHARGE. Price includes the Spanish Food Protection Certification Online Course as well as the English live class and the Spanish Online Exam. Also receive full Online Study Portal access with full Spanish videos, presentations and quizzes to prepare for the exam. PRIVATE SPANISH CLASSES AVAILABLE AS WELL! Click on the State to reveal locations. Ohio Level 2 made easy! Online course completed at your convenience prior to your exam date. You then attend the class date you select from the schedule below for a review of the material and exam is administered. Attend our scheduled "Live" class which is currently a two-day course with the exam following the class on the 2nd day! All of the class details will be emailed to you upon completion of the "Live Class Registration" form. Call us at 855-478-7246 for more information! 13 - Langhorne, Nordone Inc.
17 - Langhorne, Nordone Inc.